It did seem odd that Chase Utley was out of the lineup for the first few games of the Spring Training schedule. Originally, we were told that hard workouts were the cause of not seeing Chase's 2011 debut. Now it has been revealed that Utley has tendinitis in his right knee. Grade 3: pain during activity and prolonged pain after the activity. The condition may progress to constant pain and result in a complete rupture. 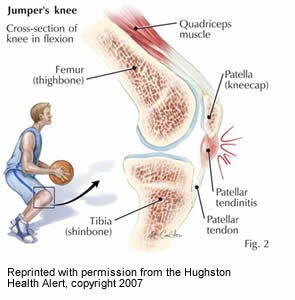 Initial treatment of patellar tendonitis involves reducing pain and inflammation in the knee. Treatments for the injury can include, but are not limited to ice, electrical stimulation, phonophoresis (ultrasound), iontophoresis (uses a galvanic current), or non-steroidal anti-inflammatory drugs (NSAIDs). Often, treatment includes ice and NSAIDs, such as ibuprofen and naproxen, because they are convenient and are known to work. To avoid injury, stretching and strengthening exercises should be performed prior to any activity. Stretching of the quadriceps, hamstrings, and calves should be performed on a daily basis. Strengthening exercises are used to prepare the body for regular activity. These exercises can include straight-leg raises in all directions, one-quarter squats, and progressive jumping. As the flexibility and strength returns close to normal, plyometric exercises can be added for more stability. Some athletes find that a patellar tendonitis brace, similar to counterforce braces used by tennis players helps to decrease pain and swelling. This brace fits just below the patella placing pressure on the tendon. Precaution prevents reinjuring a tendon or preventing an injury. Precautionary measures include stretching and regular strengthening exercises. Athletes may return to play as soon as they can perform sport-specific exercises without pain. If available, the athlete should see their athletic trainer for evaluation, treatment, and rehabilitation. It's the start of Spring Training for the schedule and we're starting to get excited that baseball is back! Here's the Phillies Talk podcast that was recorded on Thursday night, with Rich Baxter and Jim Mulry- your weekly Phillies radiocasters talking about the Phils. We need sponsors for the show, if you have a business or service that you want to advertise, we'd love to talk with you about putting your ad on our show. Join us for the historic 2011 season, inquire now! Though he is a World Series MVP, Cole Hamels hasn't exactly garnered all the attention in this year's Phillies rotation as you think he would. The addition of Roy Halladay, Roy Oswalt, and again Cliff Lee has pushed Hamels stock down a little as he takes the ball this afternoon in Florida against the Yankees. The Phillies seem like they are ready to get down to business this year. A rotation that they have in place doesn't happen very often, in fact more recently it just doesn't work like this at all anymore. Teams are lucky to have one 'ace' on a pitching staff, and the Phillies really are stacked with aces this year. Will all the pieces stay in place to allow the Phillies a chance to get into the World Series again this year? Or will this show of pitching prowess be just as the Yankees found out that you can't 'buy' World Series appearances. We'll have a long road to see just what happens to the Phils, but the Spring season begins today, and it's so nice to have baseball back. Check out the Phillies starting lineup vs. the Yankees from David Murphy at the Philly Daily New down in Florida here. In case you missed it, Chad Durbin did sign with the Cleveland Indians yesterday. He will not be returning to the Phillies this year. The first Spring Training game of the season is Saturday, now that the Phillies have put the tuneup game behind them with the Florida Semioles. I don't like to read too much into just about anything that happens in Spring Training, obviously it's better to win, but, this is more a time that the team gets in shape and ready for the season. It's gonna be Bartolo Colon going for the Yankees, and for the Phils the starting pitcher hasn't been officially announced yet. KYW Radio as of 7 PM tonight is reporting Cole Hamels to be the starter for the Phillies on Saturday afternoon for the Phils. Hamels is said to be in great shape for Spring, and can't wait to get out on the mound for the Phillies. The Phillies start their unofficial first game of the Spring Training season this afternoon with a tune up game against the Florida State Seminoles today at 1:05 PM. It's the first game that the Phillies will play under the new 'Dream Team' setup of the starting rotation that Phillies have put in place. The Seminoles have been very successful in the past few years, they've made the College World Series a total of 20 times already. The Florida State team is the most successful team in Division I baseball since 2000. Read more about the Sems here from the Orlando Sentinal. Jimmy Rollins, who was invited by President Obama to a Motown Sound awards ceremony in Washington DC, won't be playing today as well as Chase Utley, who is sore from some heavy workouts. Maybe Utley should have started his 'intense' workouts the week earlier, or he should have adjusted his workout accordingly if he did too much lately. None of the Phillies 'Fab 5' starters will face the Seminoles today, the Phillies will throw their reserves at the Florida State team. Look for the Phils to start Halladay on Saturday against the Yankees, although this is just my speculation. It's always Jimmy Rollins who usually steps out on a lidge for the Phillies with some preseason comments and tomfoolery with the press. That is the Phillies, now we have a new contender for trash talking or prediction making in the National League. No, it's not the NY Mets and the usual suspects... it's someone we're more familiar with. That someone is Jayson Werth. The new Washington Nationals multimillionaire outfielder has given up his usual reserved demeanor and has laid down what he expects to be true in the National League. Jayson Werth said on his new Nationals team, "No one has won any games or lost any games this year. I've always said, I look for the challenge and I pull for the underdog. I'm in a situation here where it's going to be a challenge. We are going to do some things most people think are impossible. I love that position." It seems like the player just hit camp, but already there is games to be played starting later this week in Clearwater. There will be a tuneup game with the Phillies and the Florida State Seminoles at 1:05 PM on Thursday. The first MLB opponent will be the NY Yankees on Saturday, Feb 26th at 1:05pm in Tampa, just up the road from where the Phillies train in Clearwater. d) The player was not selected by the assignor Major League club in the immediately preceding Rule 5 Draft. The earliest date a club may backdate a placement on the Major League 15-day disabled list. Opening Day 2011. All clubs are required to reduce rosters to 25 players. Microsoft Store's President's Day Sale! Save $150 on a new PC for a limited time. Hear how J.C. Romero feels about coming to camp healthy this year, and what he expects from himself. Thanks to MyPhl17 for the interview. Tickets for the single games went really fast today, lines formed all morning long at Citizen's Bank Park with the fans who obviously have Phillies fever! More on this over the weekend. It's almost Spring around the Philly area, but in Clearwater, Fl it is really looking like Spring now that the pitchers and catchers are there. Hear this week's show to see how we feel about the Fab 5 and what they will do this season for the Phillies! Coverage of Phillies Spring Training from Comcast, marks the beginning of Spring Training! Pitchers and catchers (and a few other players) are in Clearwater and working out. See the story here. Thanks to CSN Philly. Outside of the Phillies, I am setting out in this post to see what baseball team in the NL East will be most improved this season. Just looking at last year, I would have to say that the Braves stand to be the most improved based upon some of the players they have added to their roster in the offseason. Last year, the Atlanta Braves almost returned to their old form with a stunning improvement and made the playoffs for the first time since 2005. It had been a long drought for the Braves, who from 1991 to 2005 basically controlled the NL East. In that time period, the Braves appeared in the World Series five times, though they only won one of those series. They always say that a lot of people only remember when you win it all, and that rings true most of the time in baseball. When you look at a team like the Braves last year, their were several reasons that you could offer that explains some of the success they had. Bobby Cox retired from baseball last year, he had been the skipper of the Braves forever it seemed. Players really admired Cox, and played their hearts out for him last year. Injury and some bad luck prevented the Braves from going deeper into the playoffs, after it seemed that they may not even been in the post season after losing several key members of the team to injury. Another reason that the Braves did so well last year is that they got on base a lot, the team finished first overall in the NL with a .339 OBP. Just getting on base a lot puts you into a great possibility to score runs. In the off season, the Braves solidified their second base position by adding Dan Uggla. Uggla is one of the best second basemen in the NL. It is kind of rare that a player of his caliber will stay in the same division after leaving a team like the Marlins just as Uggla did. The Braves inked Uggla to a 5 year deal, and even paired him up with the old Florida Marlins manager, Fredi Gonzalez, who probably knows Uggla better than anyone on the Braves team. Lance Parrish is the Braves new hitting coach, and his experience can only help the Braves improve in the batting department this year. Chipper Jones may just make his final appearance in 2011, his injury plagued year last year is not the kind of memory he would like to have of his last year, so I expect him back for a last hurrah this season. In fact, Jones has already been taking a lot of batting practice with new manager, Fredi Gonzalez. Jones had a torn ACL last year, and it remains to be seen if his health will allow him to put in a complete season but we'll see what happens as time goes on into June and July with Jones. The payroll for the Brave clocks in at about what it was last year, around the $89 million dollar mark. Outside of the great run by the San Francisco Giants last year, the Braves would have to be on everyone's book as possibly being the team to give the Phillies the best run for the division in 2011. There is always the Mets also, they are a team that have a lot of pieces to their puzzle starting to take shape. We'll look at what happened with the Mets in this offseason in a future post here at FightinPhillies.com. Last year the Braves finished the season at a respectable 91-71 in second place just 6.0 games behind the Phillies. The Braves will be starting their 136th year as a professional baseball team this year. How will the Phillies start off this year? The Phillies have been notorious for slow starts over the years in April. Last year, they got off to one of the best starts they've had in years. 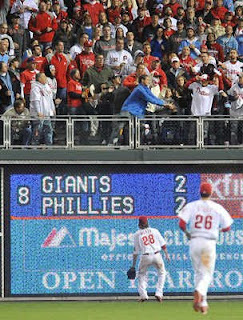 The Phils went 8-2 in their first 10 games in 2010. Both losses in the first ten games came at the hands of the Washington Nationals oddly enough last year. In their first 10 games last year, the Phillies played the Nationals 6 times. The great start last year was in part by a nice 5 game win streak that saw the Phillies sweep Houston in the Astros home town, and then the Phillies won two more against the Nats to run the streak to 5 in a row. Baseball can be a game of streaks, and when things are running good for a ball club like the Phillies, the sky is the limit. Of course, things can be streaky in bad ways too. At the worst times last year, the Phillies got mired into a 5 game losing streak from 5/22 to 5/27. The Phils lost the last two games in a series at home against Boston and then lost 3 straight in New York. 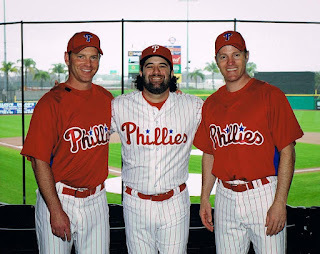 The Phils then rebounded with two wins against Florida and then promptly went on a 4 game losing streak by losing the last game of the series with Florida and getting swept by the Braves from 5/30 to 6/2. This probably prompted Ruben Amaro's sound of alarm when he really became concerned about the Phillies chances of even making the playoffs at that point in the season. The saving grace of last year really was courtesy of the last 20 games of the season. During the last 20 games of the season, the Phillies tucked a season high, 11 game win streak into that time period. The team only lost 5 games out of 20 to finish the season out on a very high note. The Phillies swept Florida, Washington, and Atlanta in three straight series in September of last year and had one win in games against the New York Mets series twice to total the 11 game win streak. The mechanics of Hamels, Halladay, and Oswalt came into play at the end of the season, and now the Phillies have even more fire power with Cliff Lee setting this rotation into 'tilt' status if we were talking pinball! How have the Phillies done to start the season off in previous years? 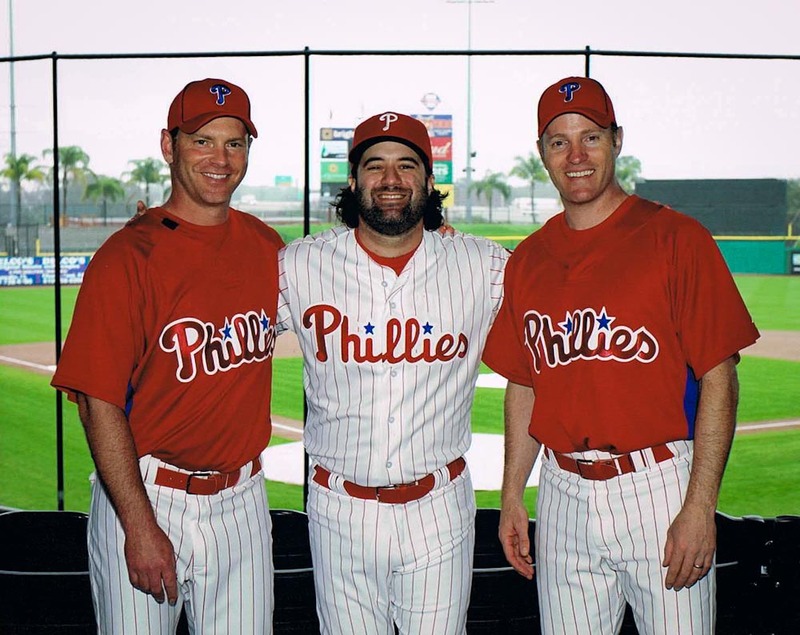 We talk with Bryan Sargent who just had the time of his life at Phillies Phantasy Camp in Clearwater, Florida. Find out all of the fun that he and others had on this recent trip to play ball with the pros at the Phillies Clearwater complex. Check out Bryan's blog here, where he chronicled his time as #31 on this year's Phantasy Camp down in Florida. Join us live at 6:45 PM on Thursday night to hear all about the fun that was down at the Phillies Phantasy Camp last month. It's the time that memories are made of, and you can hear all about it, and ask some questions yourself! Just join us on the live show, and you can call us if you want to talk with Bryan about his experience. Tune into the FightinPhillies.com blog at 6:45 PM and you'll be able to hear the live show on the player in this post!